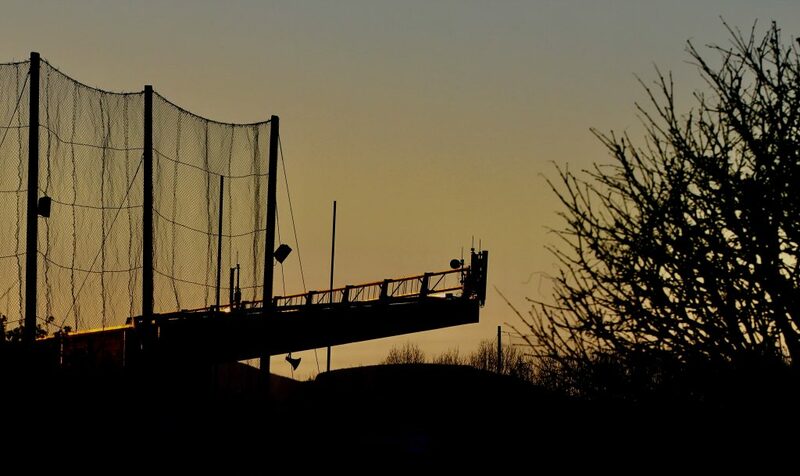 All in the club were deeply saddened to learn of the passing of John Kissane this week. Originally from Doon East, Ballybunion, the Kerry native moved to Nenagh in the 1980s and found a home in Nenagh Éire Óg where he would have a massive influence both as a player and coach. 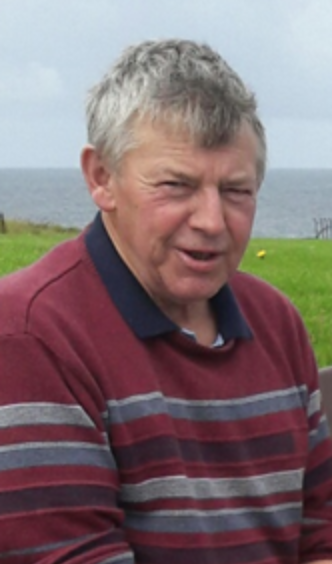 He was a part of the intermediate and junior football teams that captured North and county honours in 1986 and 1988 but it was for his Gaelic football coaching that will be fondly remembered by many. During the 1980s and 1990s Nenagh was one of the most dominant clubs in Gaelic football in the county and won numerous honours, both in the North and county during this period, thanks to the influence of John. With John as coach the club won an impressive seven North Tipperary senior football titles, two North Tipperary intermediate championships, seven under-21 titles and seven minor titles as well as a myriad of juvenile crowns. We also won two county intermediate, two county junior, two county under-21, one county minor, two county under-16, one county under-14 and two under-12 county titles, all in the A grade, under John’s watchful eye. Thanks to John’s coaching and influence a large number of players from Nenagh Éire Óg and in neighbouring clubs whom he coached, represented Tipperary at inter-county level. He was very proud of the senior career of Mark Sheahan and 1998 was a particularly satisfying time for him as three of his players, Chris Bonar, Jim McAuliffe and captain Kevin Coonan, were part of the Tipperary junior football team that won the Munster and All-Ireland finals. He also coached Brian Farrell who was part of the Tipperary minor football panel in 1995 that captured the Munster title. John himself was also an accomplished referee who took charge of numerous games within the county while his son Alan has become one of the top up and coming referees in Munster. John was also a selector with the Tipperary under-21 sides in 1993 and 1994 and was heavily involved with numerous divisional North Tipperary sides. To Alan, Mairead (Young), Enda and Amy, grandchildren Ewan, Ronan, Garvan, Sarah, Noah, Clodagh, Daire, Emmett and Aoife, son-in-law Alan, daughters-in-law Marisa and Orla, brother-in-law, sisters-in-law, nephews, nieces, cousins, neighbours, relatives and friends the club offers its sincerest sympathies. Tommy Mulcahy, pictured with the All-Ireland winning Community Games team. Everyone in the club sends their congratulations to out very own Laochra Gael, Tommy Mulcahy. “Muller” as he is affectionately known as is fully deserving of this award after a lifetime of service to the GAA and in particular to Nenagh Éire Óg and St. Mary’s Handball Club. 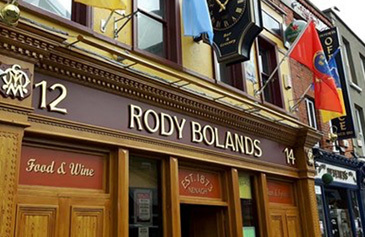 Currently Tommy is the club’s vice president and in the past held every administrative role within the club while he also served as chairperson and secretary of St. Mary’s Handball Club as well as holding various positions at Bord na nÓg level. Tommy has more than once put his shoulder to the wheel when it comes to the club and held many managerial roles with adult and juvenile hurling and Gaelic football teams over the decades. A prominent referee he was the man in the middle for numerous championship matches across the county. Most, if not all of the players in the club have at some stage been coached by Tommy as it gave countless hours of service to the juveniles and without his enthusiasm and dedication camogie would not be in the prominent position it currently enjoys as he, in the past, coached the game in St. Mary’s primary school and helped them achieve numerous Cumann na mBunscol titles. We also extend our congratulations to Anslem Walsh of Shannon Rovers who also picked up a Laochra Gael award. Anslem’s sons Rory and Oisin played with the club at juvenile level while Anslem himself helped coach our juveniles during the 1980s. Congratulations to all the worthy winners. Without their selfless volunteerism, the GAA would not be in the healthy position it enjoys in Irish society. 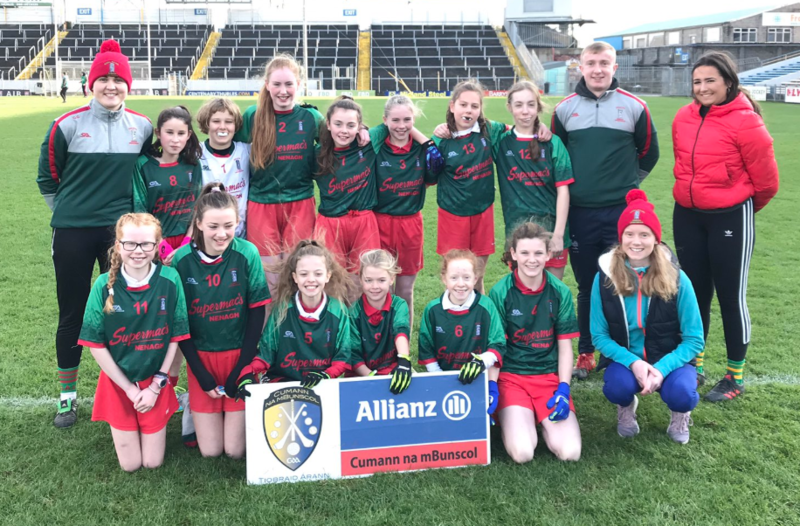 This week was a historic occasion for the primary schools of the county as for the first time ever all the Gaelic football finals were held in Semple Stadium and Nenagh were represented by Gaelscoil Aonach Urmhumhan. 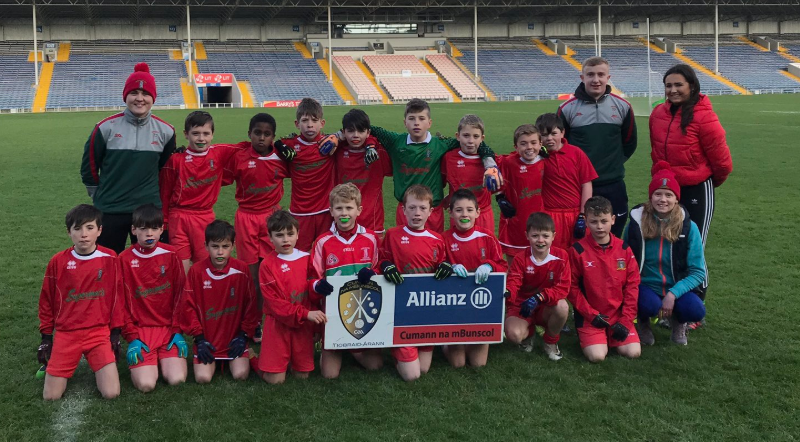 The boys were successful in the under-11 final against Fethard while the under-13 girls were unfortunately defeated by St. Joseph’s, Tipperary however, while it is nice to win the importance of having fun and getting to experience playing in Semple Stadium is of far more significance. We wish to thank the school and indeed all the schools in the parish for their continued support of Gaelic games and the staff for kindly volunteering their time to teach the fundamentals of our games to the young boys and girls. 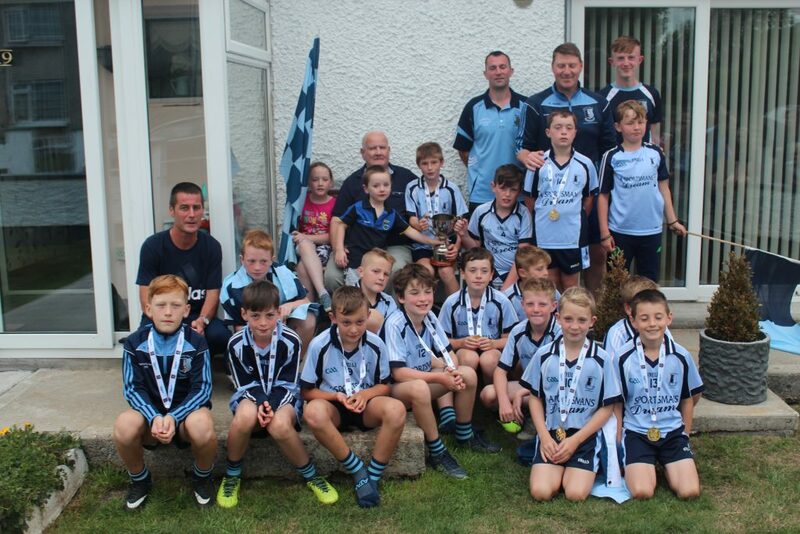 One Nenagh man deserves huge praise for the continued success of Cumann na mBunscol and that is their PRO John Manly. John has given countless hours over the years organising and promoting this tremendous competition as well as coaching Gaelic games in Nenagh Éire Óg and it was fantastic to see his own school, Dualla NS, capture some silverware in Semple during the week also. 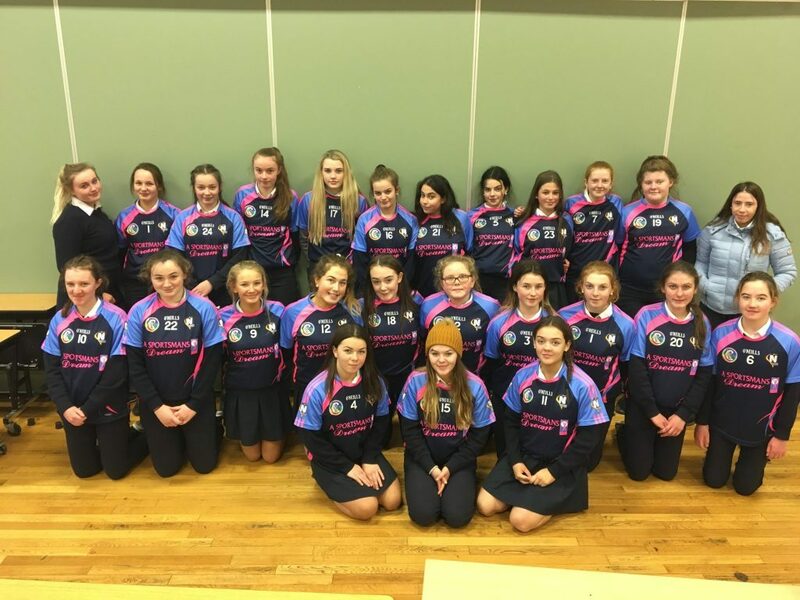 Congratulations also go to St. Mary’s first year team who captured the county A champions on Wednesday last after great wins over Cashel Community School and Ursuline, Thurles. Kerry Howard played in defence and had two fine games while their senior team advanced in the Munster senior B championship after a great win over Scariff. Meanwhile, Nenagh CBS recorded a 3-10 to 0-9 win over Gaelcholáiste Mhuire an Mhainistir Thuaidh (Cork) in the Dr. Harty Cup and have now advanced to the quarter finals. The draw for the quarter finals will take place next month. 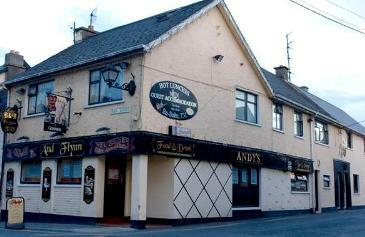 Best wishes go to the Nenagh College senior team who are in action tomorrow, Monday. 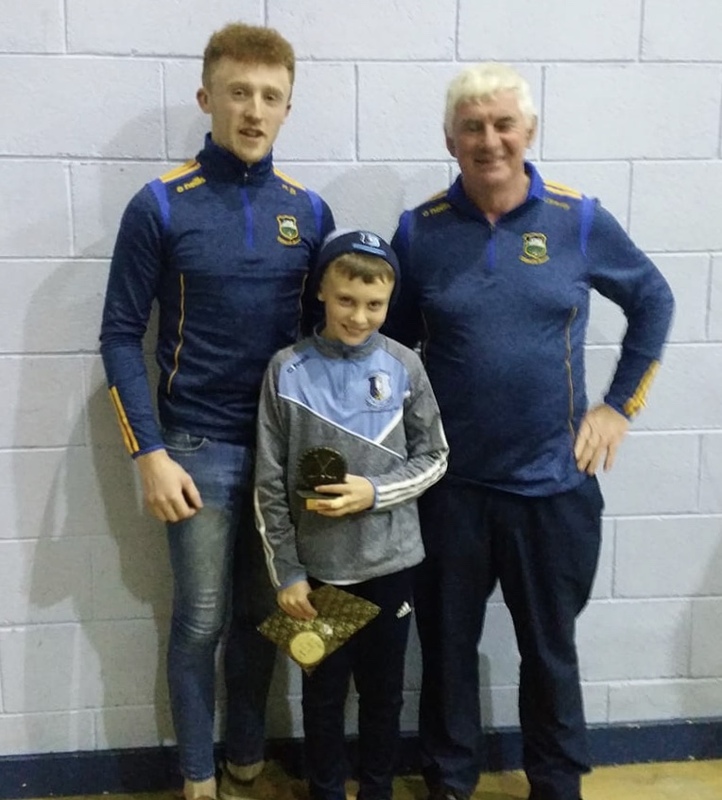 The great Michael Ryan collects the under-11 medals his fantastic side won this year from Robert Byrne and John Sheedy of Portroe on North Tipperary Captains’ Night in the MacDonagh Park complex this weekend. 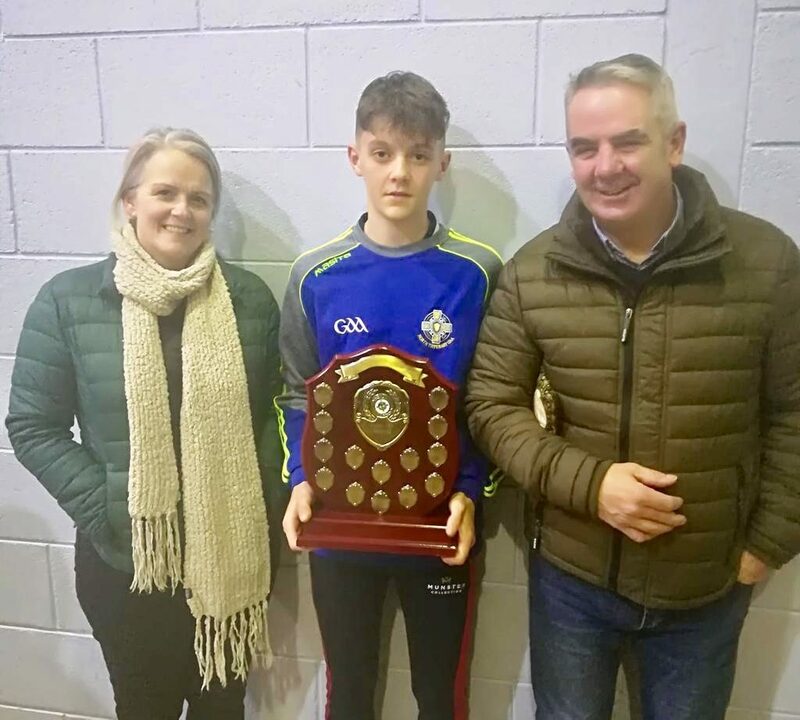 Proud parents Mags and Andy Cawley with their son Mason who collected medals on behalf of the under-13 squad at the North Tipperary Captains’ Night in MacDonagh Park on Friday last. 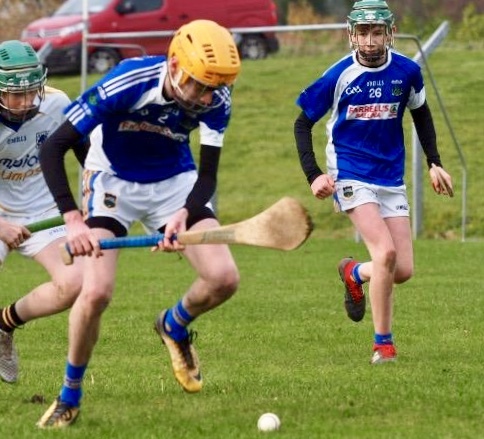 The Peadar Cummins side were defeated by South Tipperary in the semi final but later beat West Tipperary. 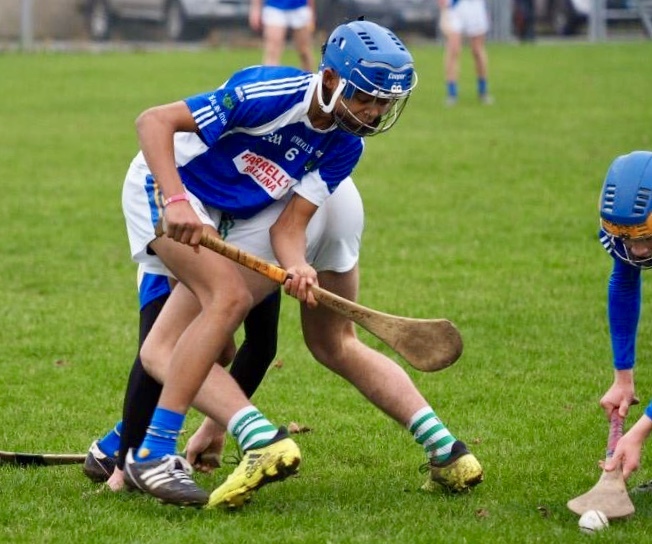 We had two players on the under-14 Roger Ryan panel, Conor Tierney and Taurai Shayanewako, who reached the final but were beaten by Mid Tipperary. Best of luck to Tom Kennedy, Dermot McTiernan, Jamie Kennedy, Aaron McLoughlin and the North Tipperary panel in the Garda Cup this Saturday.